Description: A sprawling plant with small, alternating leaves that are light to dark green in color. 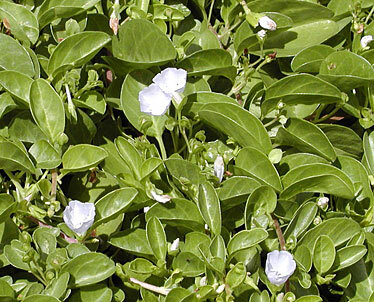 The leaves of Pa‘u o Hiiaka were used as med-icine for babies who had thrush. Delicate flowers about 1 inch in diameter emerge from the leaf axis and range in color from lavender to white. They often look like vines crawling on the ground, but can become quite thick in some areas. In extremely harsh and dry regions, the leaves and stems of pau o hiiaka might be covered with fuzzy soft hair that helps the plant adapt to better suit those living conditions. In other areas the leaves might still be green but become thicker and more waxy in appearance. This also helps the plant retain water. Distribution: This endemic subspecies is commonly found throughout the Hawaiian Islands on rocky coastal sites co-existing with other native strand flora such as ilima papa, nehe, hinahina and alena. Cultural uses: Leaves were commonly used as a cathartic, to treat babies with thrush. The vinelike runners were braided and used as a quick form of lashing when other fibers were unavailable. Landscape use and care: This is a great ground cover for places that are extremely dry and hot. Plant them about a foot apart and they'll fill in nicely. Soak the ground every other day initially, then slowly wean off. Depending on the size of the planting area, hundreds, if not thousands of flowers will appear. Blooming is normally constant once the plant is established and watering is lessened. Right now we have beautiful specimens of the silvery-white form of Pau o Hiiaka at our nursery in Kaneohe for $4 in a 6-inch pot. It also sells for about $5 at Home Depot. Additional infomation: Pau o Hiiaka means "skirt of Hiiaka." Hiiaka is the younger sister of Pele, the fire goddess. The name comes from a story that has Hiiaka waiting on the beach as Pele is surfing. Hiiaka falls asleep and when Pele returns she finds that her younger sister has this vine draped over her to protect her from the sun.